OpenVPN is very popular open-source software application that implements virtual private networks (VPN). It uses a custom security protocol that utilizes SSL/TLS for key exchange. We very often configure only IPv4 for the VPN service. But if you have IPv6, why not enable it for VPN? First, let’s quickly see how can we install OpenVPN in an Ubuntu server; we will then enable IPv6. This will create the necessary certificates and create the first client. The client certificate will be stored in the home directory. 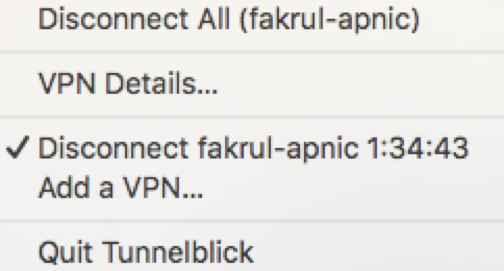 To connect from MacOSX, you can use TunnelBlick. To add a new client, run the openvpn-install.sh script. Choose option 1 to add a new client and the certificate will be stored in the home folder. Now let’s enable IPv6. For the configuration I am using IP 2001:db8:ee00:ee00::10/64 for the VPN server. 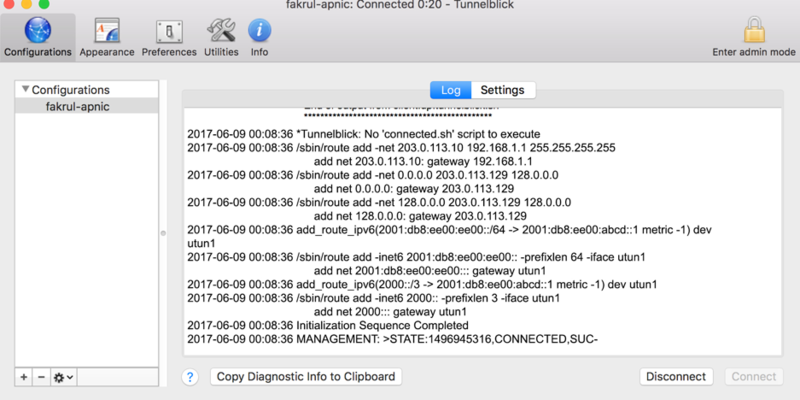 Try to connect your OpenVPN client. So you now have native IPv6 and can access all IPv6-enabled services. As a roaming user, it will give you better security. for tun-local:- 2001:db8:ee00:abcd::/64 (TUN interface). Can you please point out where is the problem ? One problem is that you are trying to use a block that’s not yours. Your address needs to be one you acutally have. Not the authors. Second, your error is saying there is no route out. Probably because you don’t have your addresses configured right. Contact your ISP to get the v6 blocks that you need. If you get a /56 you can net it out to use a xxxx:xxxx:xxxx:1::X for the server and xxxx:xxxx:xxxx:2::X for your users. Thank you for this good and simple tutorial. Here is my openvpn static-key config, already tested on openwrt. route 0.0.0.0 0.0.0.0 vpn_gateway 500 #Fix “Unidentified network” on Windows 10.
route-ipv6 64:ff9b::/96 #You can add this route, if nat64 gateway is set up on the server.